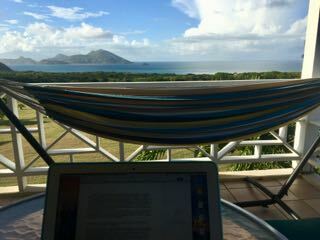 You might be asking yourself just where is Nevis! Nevis is a little known island off the coast of St. Kitts in the West Indies, it is probably the most relaxing of all of the islands in the Caribbean. This tiny 36 square mile tropical wonder right next door of St. Kitts has been voted the most romantic island in the Caribbean by Conde Nest Readers Choice Awards. Paradise…. That pretty much sums up the the most Romantic Island in the Caribbean! 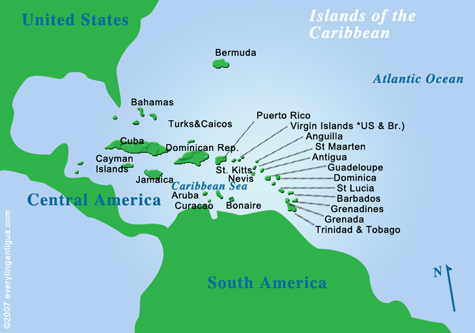 A few things I have learned are- there is a low crime rate, St. Kitts is a 7 minute speed boat ride away, it is the birthplace of Alexander Hamilton, there is no fast food you have to take a water taxi to St. Kitts for that, the only cruise ship you will see there are the smaller luxury cruise lines and you won’t find any buildings taller than a palm tree, this is why everywhere we turned there were amazing views. I am sitting on my balcony over looking a hillside with cattle and donkeys grazing (yes donkeys some places have wild horses Nevis has donkeys) and if I’m lucky I will see a monkey or two playing with some goats, beyond that is the beautiful Caribbean Sea and a view of St. Kitts. It was a 12 hour journey from Seattle but well worth it! Within 2 hours of landing in St. Kitts I was in the pool relaxing with a refreshing rum punch before I had to get ready for the welcome reception. The Mount Nevis hotel is owned by Dr. Adly designed by Yost Grube Hall Architecture in Portland. They have multiple awards of Excellence and are members of Preferred Hotels & Resorts. It is not on the beach but they have a shuttle that will gladly take you and pick you back up when you want you are ready. The Mount Nevis is a small intimate property with 15 rooms that would be perfect for a small wedding party, the ceremony could be performed at Cottle Church just down the lane. We are touring some fabulous destination wedding venues and hotels, yesterday we went to the Nisbet Plantation for lunch and a site tour. It is a wonderful historic property with a great beach and delicious food! The only television you will find on the property is in the sitting room in the Great House which happens to be just on the other side of the bar. Thursday nights they have live music and BBQ on the beach. After the Nisbet Plantation we visited Oualie Beach Resort which is perfect for the budget conscious traveler, clean and comfortable and right on a beautiful beach, then it was back to the Four Seasons for a wedding trade show where we met other folks in the industry from Limo’s to decor, cakes to wine and personalized bottles of cider and other wedding essentials. By Friday I will be able to say with confidence that I am a Nevis expert and I already think this would be the perfect place to have a Destination Wedding. 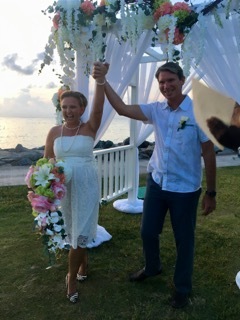 You can even get married on a whim since there is no waiting period, just remember you can’t wed after dark in Nevis. They took us to the famous Sunshine’s Beach Bar & Grill where we laughed and talked and enjoyed the famous Killer Bee. The locals welcomed us with open arms and Sunshine’s nephew Colis gave us a photo tour of all the famous people on the wall that have come and posed with Sunshine-Oprah, John Travolta, Chris Meloni, Meryl Streep, and so many more. They have sports pendants and flags and I found at least 2 Seahawks flags as soon as I walked in the door. Another fabulous property is the Villas at Paradise Beach by far my favorite Villa property we visited. Gorgeous 4 bed 4 bath Villas with great kitchens, swimming pools even a BBQ Grill. The beach is just an easy walk down the hill and has a beach bar, kayaks, snorkel gear and paddle boards. The Hamilton Inn is an upscale villa property with pools and a gorgeous beach with a beach snack shack, the spa and tennis court are scheduled to be open soon. There are 420 rooms for rent on Nevis and each property is diverse, some have Air Conditioning and televisions, others are more rustic and natural. This does not mean they are awful by any stretch of the imagination. The Hermitage Plantation Inn owned and operated by The Lupinacci family is an antique lovers & foodie paradise! The Great house is said to be the oldest wooden house in the Caribbean is made of Ironwood. Take a step back in time to cute little gingerbread cottages with carved four poster beds draped with netting, antiques and gorgeous wood work everywhere you turn. 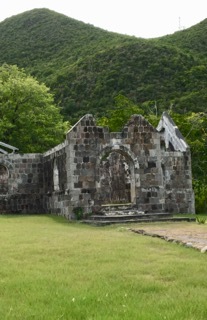 There are 62 Churches here on Nevis and the one not to miss is St. Thomas’ Lowland Church The first Anglican Church in the Caribbean is the oldest church on Nevis built in 1643. 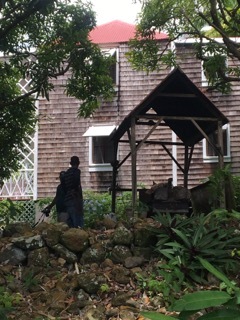 Another historical site to see is The Nevisian Heritage Village, it is an old sugar mill and Pat the site manager is the sweetest person I have met so far she has passion for her job and the place would be the perfect location for a Destination Wedding. An open air museum where you will find houses dating from the Carib Indian era, are replicas and are furnished with antiques and relics of their relevant periods. You will find the blacksmith’s shop, rum shop, and the shoe-maker’s shop, along with dwelling houses. To complete this traditional village setting are “backyard” gardens, beautiful flower gardens and various species of indigenous plants and shrubs some adorning the typical “estate yard” ruins. And, there’s even an area for animal rearing. We toured the Four Seasons who have been our main hosts this week, they are not your typical Four seasons however they are fabulous and have lodging from suites and ocean front to mountain villas and everything in between there are a pools including an adult only quiet pool. There is a great golf course where we attended a Vow Renewal Ceremony with the works, open bar and an awesome band that wanted to keep playing as long as people were still dancing. We’ve been to the Golden Rock Inn owned by artists Brice and Helen Marden. It is up in the hills with more spectacular views, it is a refreshing unique artistic place it is also an old plantation they have a great restaurant band be sure to ask about the conch chowder when you get there. There is something here for everybody, unless you don’t like tropical sea breezes, great food, wonderful people and stunning views… In that case you might want to stay home. 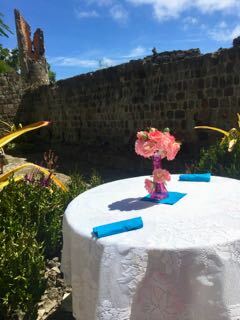 The Montpilier Plantation Inn which sits 750 feet above sea level in another former sugar plantation with a history of being a romantic hideaway was our host for the last evening where we were served another amazing meal and received our certificates for Nevis Romance Experts. The main house is contemporary with a 60 foot pool, you can be taken to a hidden cove where you will find a private beach with hammocks, cabanas and even a beach bar. There is a garden with a relaxing spa treatment by certified therapists and is a great place to ride horses, go hiking, play golf and tennis or just sit back and take it all in. Where else can you have a private dinner in a 300 year old sugar mill? Nevis may be small but it is for sure a wonderful place to visit and embrace the slower pace and friendly people. It seems like a sleepy little island and it is for sure but there is a vibrant night life with live bands, great food, and great people. A must visit place is Miss June’s or what is now The Pub but everyone still calls It Miss June’s. We ran into Michelle Miss June’s daughter and had a great visit we didn’t have time to get there but I will for sure make it a point to go have a beer and say hi when we go back. It is worth it to take the time to go into Charlestown for a meal and do some shopping just remember you are on island time and be prepared to go by chef’s choice even at 9 am in the morning. My wonderful friend Annette and I went to breakfast and ended up having fried fish, mashed potatoes and salad we just looked at each other shrugged and said sure. Go with it you are on an adventure! We had our meal and went shopping also a good tip is to take cash either USD or EC they gladly accept both and not all accept cards. Find Gems for some Gooseberry Ice cream and sit on the pier and enjoy the view for a few. I can’t thank the Nevis Tourism authority and all of the hotel partners and taxi drivers that showed us around and made us feel at home for the last 5 days. I will definitely be coming back! Are you ready to book your trip to paradise? Let’s have coffee and plan your amazing getaway today!